Plastic bans are now in vogue. Several countries, in the name of combating plastic pollution in the ocean, have begun banning various plastic products: utensils, bottles, and bags that often get thrown away after one use. In the United States, these efforts have centered on the plastic straw. On July 26, the Walt Disney Company announced that it would eliminate single-use plastic straws and stirrers in all its locations by mid-2019 as part of its “journey of environmental stewardship.” Disney also plans to reduce other plastic products in its hotels and cruise ships as well as plastic shopping bags and styrofoam cups. The company has said it will introduce these lids in Seattle and Vancouver this fall, and continue with the rollout in the US and Canada next year, with the goal of taking them global. Eventually, this will mean eliminating more than 1 billion plastic straws per year. Seattle, the home of the mega coffee company, became the first major US city with a plastic straw ban on July 1. New York City has proposed legislation to ban plastic straws in the city by 2020. Malibu and San Luis Obispo, California, and Miami Beach and Fort Myers, Florida, have similar efforts in the works. There’s also a trending hashtag, #StopSucking. Chelsea Clinton, Neil deGrasse Tyson, Russell Crowe, Tom Brady, Sonam Kapoor, and Tom Felton have all pledged to “just say no” when handed a plastic straw. 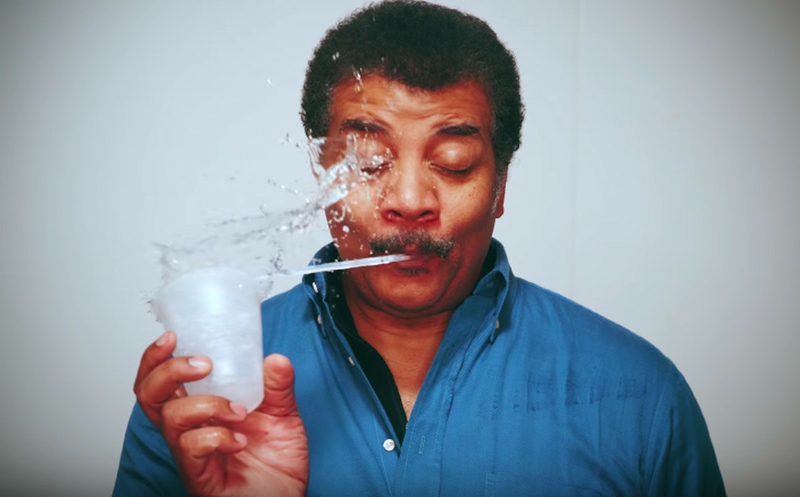 Neil deGrasse Tyson getting a straw knocked out of his mouth, in a video promoting Lonely Whale’s anti-straw campaign. Why did banning the plastic straw — something so small and forgettable that it tends not to be recycled — go viral as a form of consumer environmentalism? Straws are far from our biggest problem when it comes to marine plastic pollution. And they are necessary for people with certain disabilities, who feel that they have been left out of the conversation. But activists hope that straws will be a “gateway plastic,” encouraging people to forgo other single-use plastics such as bags and bottles. Straw bans aren’t going to save the ocean, but they could jump-start much-needed conversations about the level of non-biodegradable trash in it. Let’s walk through what we know. 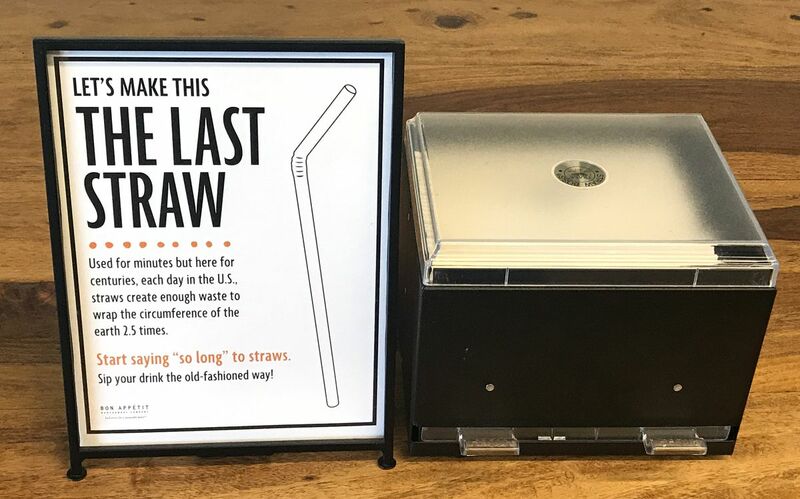 A sign displayed at the University of Portland, which uses Bon Appétit for food services and became the first university to stop all use of plastic straws. We started using plastic in the late 19th century, after celluloid was invented. By the 1960s and ’70s, single-use plastics like bags and straws had become cheaper, more convenient, and more ubiquitous than their paper counterparts. Now plastic straws can be found pretty much anywhere food is served (with the exception of the highest-end restaurants). And while the exact number of straws thrown out in the US today is unclear, one estimate we found (using data from Technomics) put it at 175 million straws every day. Plastic is not biodegradable, which means it does not break down into compounds (like carbon dioxide or water) that can be easily reused. 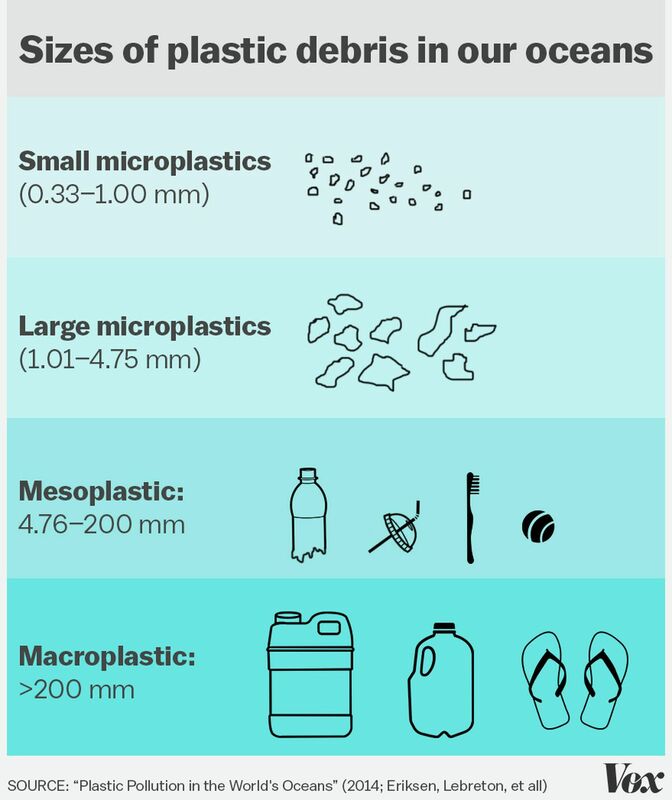 Large plastics will, over time, degrade into small particles known as microplastics. Not only are microplastics potentially carcinogenic on their own, but they also attract harmful pollutants. And they stick around forever. Because plastic doesn’t decompose quickly, when it becomes waste, it tends to either end up in landfills or wash into the ocean. The World Economic Forum reports that there are 150 million metric tons of plastics in the ocean. And if we continue this trend, scientists predict there will be more plastic than fish in the ocean by 2050. One of the landmark studies of ocean plastic was published in Science in 2015. The researchers found that we generated 275 million metric tons of plastic waste in one year, of which 4.8 million to 12.7 million metric tons get into the oceans. Plastic kills marine life partially because of strangulation or choking. But the larger reason plastic is so dangerous is that it releases toxic chemicals like bisphenol-A (BPA) when it breaks down. BPA, which mimics estrogen, messes with our hormones and can be carcinogenic. A recent study found that plastic also kills coral reefs by making them more susceptible to disease. 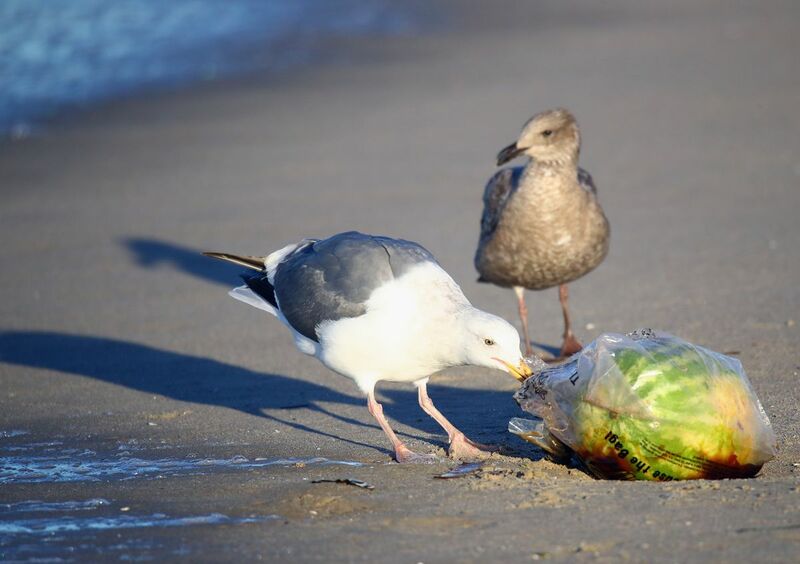 A PNAS study found that 90 percent of seabirds have ingested plastic. Microplastics will inevitably get into our food — through both the fish on our plates and the water in our bottles. But researchers still aren’t sure how toxic microplastics are when we consume them this way. A lot of this plastic collects in “garbage patches” that form as waste and debris get pushed together by circular ocean currents known as gyres. These patches are not solid masses; rather, they are mostly made up of microplastics that make the water cloudy and gelatinous. At about twice the size of Texas, the largest garbage patch is the Great Pacific Garbage Patch, which has been given the horrifying moniker the Pacific Trash Vortex. But garbage patches only provide a surface-level glimpse of the issue — literally. Only about 1 percent of plastic waste collects at the surface; most of it aggregates at the floor of the ocean, where deep-sea sediments behave as a sink for the microplastics. Several environmental organizations have made straw bans a priority lately — raising awareness, nudging celebrities to come out in favor of them, lobbying cities and states to enact them. But some advocates told me their deeper motivation is to build support and awareness for the need to ban other plastic products that are more significant sources of plastic solution than straws. 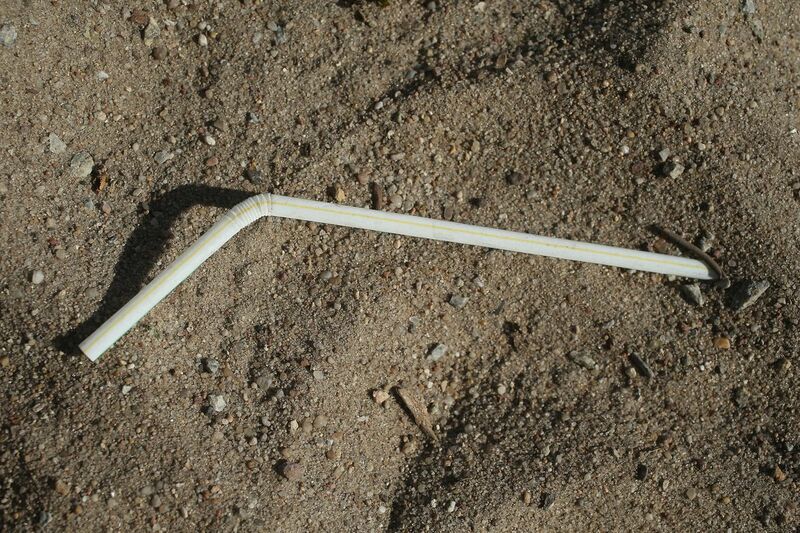 Lonely Whale’s “Strawless in Seattle” movement began in September 2017, when the organization began partnering with Seattle-based businesses to end their straw use. The humble plastic straw is the face of a new movement. The mayor of Seattle has since announced a ban on disposable plastic straws, spoons, forks, and knives, which will be officially enforced starting July 1. As of now, the ban will only apply to restaurants; those who are found in violation will be fined up to $250. But Seattle’s success has already inspired several other coastal cities in states like California and Florida to follow suit. We know there’s a massive amount of plastic in our oceans, but plastic straws are far from the biggest source of plastic pollution. The Ocean Conservancy’s 2017 Coastal Cleanup Report compiled beach cleanups around the world and found that the most common trash item found on beaches is cigarettes, followed by plastic bottles, bottle caps, wrappers, and bags. Straws and stirrers placed seventh on the list, at about 3 percent of the total trash. Bloomberg News estimates that on a global scale, straws would probably only account for 0.03 percent of total plastic waste by mass. Another study found that an estimated 46 percent of the debris in the ocean is abandoned fishing equipment. On a macro scale, it’s important to look at the plastic straw ban for what it really is: a first step toward drastically limiting plastic in the ocean. How realistic is that leap? Part of the answer to this question can be found in a little-known theory called “spillover” —the idea that engaging in a single behavior can psychologically motivate us to engage in either more or less similar behaviors. Let’s say we were interested in learning what would happen once people begin following a plastic straw ban. They may decide to become more environmental by decreasing the use of other single-use products or supporting environmental policy change (which is called positive spillover), they may decide that their one good deed gives them the right to take an extra-long shower (negative spillover), or they may pat themselves on the back and continue living their lives as usual (no spillover). The plastic straw ban advocates are essentially hoping for a positive spillover effect. Heather Truelove, an associate professor of psychology at the University of North Florida, has studied the spillover effect with environmental decisions. Turns out, internalizing an action — making it part of your identity as an environmentalist —is the key to promoting positive spillover. And Truelove has found that in most cases regarding the environment, we do see positive spillover. The bad news: We don’t actually know what behaviors the straw ban should spill over into. A lot of people actually need straws because they have disabilities that make it difficult to lift a drink to their lips. And disability rights advocates are now speaking out against the bans, arguing that straw alternatives don’t work quite as well. In an article in the Washington Post, writer and disability advocate Karin Hitselberger noted that the plastic straw ban is part of a tradition of movements that don’t consider the opinions or needs of people with disabilities. “If you don’t need a straw to take a sip of water, pain medication to deal with the effects of a chronic illness, or a laptop to take notes in your college class, it can be easy to overlook how policies such as these impact someone else’s everyday life,” she wrote. After Starbucks announced its plan to phase out all single-use plastic straws, a group of disabilities rights advocates planned to protest outside a New York City Starbucks store. In response, the company reached out to the groups and released a statement promising to keep plastic straws on hand for those who need them. “That’s the million-dollar question,” Aimee David, with the Monterey Bay Aquarium, said with a laugh. Our current method of recycling is likely not the answer. Plastic is difficult to recycle more than two or three times, and a study conducted last year found that only 9 percent of all plastic has been recycled. “Without a well-designed and tailor-made management strategy for end-of-life plastics, humans are conducting a singular uncontrolled experiment on a global scale, in which billions of metric tons of material will accumulate across all major terrestrial and aquatic ecosystems on the planet,” the study authors wrote. One of the most popular methods of mitigating the accumulation of plastic in the first place is what David called a “source-reduction approach.” That means eliminating use of those pesky single-use plastics, with policies like bag and straw bans. Restricting single-use plastics has worked in other countries. In 2002, Ireland imposed a tax on plastic bags, which was followed by a 94 percent decrease in the use of plastic bags. A big part of the single-use plastic ban is an expectation that people will carry non-plastic equivalents, such as metal straws and utensils, with them. Aardvark, a straw manufacturing company, has been increasing production of high-quality paper straws, which they claim are better the cheaper paper straws imported from China that often degrade in drinks. A change in norms is the main reason the tax in Ireland was so effective; Elisabeth Rosenthal reported in the New York Times article that using plastic bags in Ireland actually became “socially unacceptable” a few years into the tax. As of 2017, 28 countries had imposed bans or taxes on plastic bags, with varying levels of enforcement. The United States is not one of them. Recently, Britain, Scotland, Chile, India, and Taiwan have announced plans to phase out all single-use plastics over the next decade. And earlier this month, Ikea announced its plan to end the sale of all single-use products by 2020. Although there is no national movement to ban plastic bags in the United States yet, several cities and states have taken it up. In 2014, California became the first state to ban plastic bags, and 16 other states since have imposed bans or taxes on plastic bags. But beyond source reduction, there is no real systemic plan. Long-term issues of reducing abandoned fishing gear, developing materials that can replace plastic, and creating new waste management systems still persist. What we need, according to Ives, is to have a “big conversation” about how to reduce the plastic demand. This seems daunting. But David points to the fact that ocean plastic has only just become such a hot topic, and as a result, the research has also picked up a sense of urgency. “I think that we don’t even know what the biggest solution is yet,” David said. Bring a reusable bag to the grocery store, and keep reusing it. Replace plastic bottles and utensils with metal ones. Some coffee shops, including Starbucks, will even knock a few cents off your coffee if you bring your own bottle. Buy non-perishable food such as beans, rice, pasta, and other grains, in bulk to reduce packaging, and take your own reusable containers to the store to avoid bags. Pack lunches/snacks in reusable containers instead of plastic baggies. Bring your own reusable containers to restaurants. Most will let you use your own container for takeout or to pack leftovers. And of course, it can’t hurt to say no to the straw (or try one of these reusable ones). Next articleIs Gwyneth Paltrow’s Goop pseudoscience winning?